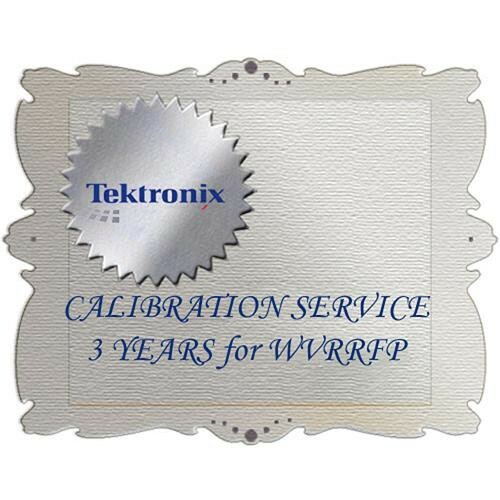 The C3 Calibration Service for WVRRFP from Tektronix is a service option available for your WVRRFP Rasterizer Remote Front Panel. It provides (3) years of calibration service coverage. Calibrations with this plan are provided at the manufacturer's recommended coverage interval during the coverage period. Purchasing this special service plan for your unit can lower your total cost of ownership, minimize downtime, and ensure specified performance over the lifetime of your equipment. Every calibration procedure includes verification of specifications using factory developed procedures, adjustment as necessary to restore performance to factory specifications, updates to instrument firmware, minor repairs when needed, installation of reliability and safety updates, traceability to national metrology institutes, a certificate of traceable calibration, and maintenance of reverse traceability records. An optional test data report can also be ordered at the time of calibration. Two delivery options exist for calibration services. Traditional depot service offers free shipping and/or pickup, priority service to minimize downtime, and coverage of all costs associated with equipment, labor, and transportation. On-site calibration service offers the same factory-certified services as depot service, but your equipment remains in your workplace and service is performed according to your schedule. Calibrations are performed in compliance with metrology standards, including: ISO/IEC 17025:2005, ANSI/NCSL Z540.1-1994(R2002), and ISO 9001. Take advantage of this special calibration plan to lower your total cost of ownership, minimize downtime, and guarantee that your equipment continues working within specifications despite unforeseen problems.